Spring time is here, the flowers have bloomed. This is a hot pink bow with flowers blooming all around. Double layers of grosgrain ribbon. 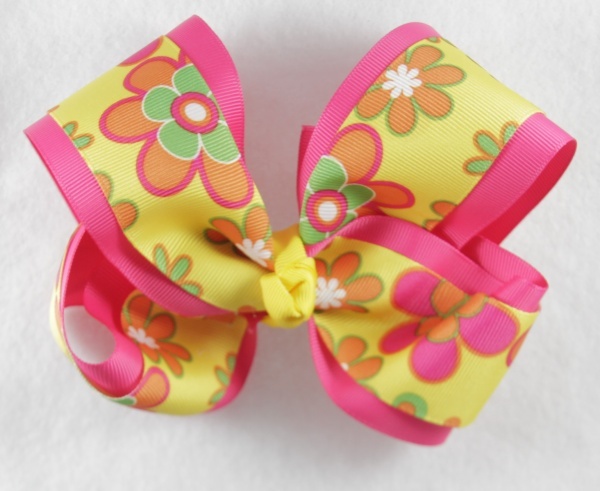 The top ribbon is a 1.5" yellow grosgrain that has orange, lime green, and hot pink flowers. The bottom layer is a hot pink 2.25" grosgrain ribbon attached to a large French clip. The center is wrapped into a french knot with a yellow grosgrain ribbon. This bow will get her ready for any Spring outfit.